The Center for Disease Control (CDC) identifies social norms as the “values, beliefs, attitudes, and/or behaviors shared by a group of people. They are often based on what people believe to be normal, typical, or appropriate. 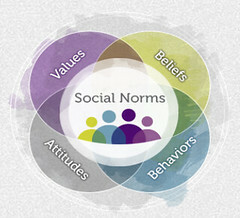 Social norms can function as unspoken rules or guidelines for how people behave, and for how people are expected to behave. People generally follow social norms because they want to fit in with the people around them." The CDC also points out that these norms can be positive or negative, and are often misunderstood. One example of this is a perceived norm that alcohol use is common among college students. Research has shown that most college students do not binge drink, and yet there exists a misperception that heavy drinking is accepted and widely practiced. This may be attributed to the stories that are most often posted on social media. Moderate drinking or abstention is simply not as interesting and therefore does not get as much airplay. This dynamic plays out with health behaviors in general. We glorify working long hours, accept lack of sleep as part of our demanding lives, manage our stress by trying to just power through it, and expect there to be a quick pharmaceutical fix for every ailment. If everyone is doing the same thing, we are more comfortable accepting these “rules” even if our intuition and our bodies tell us something is not right. All of this leads to irritable, stressed out people. The problem is exacerbated when toxic stress or trauma is a factor. Toxic levels of stress or traumatic incidences lead to heightened, sustained levels of stress hormones like cortisol in our systems, which cause inflammation and often lead to being stuck in fight/flight or freeze responses. In his 2014 book The Body Keeps The Score, Bessel van der Kolk notes that traumatic histories cause people to be pulled toward chaos, which is familiar and seems normal. When the familiar is unhealthy, a cascade of poor outcomes result. All too frequently, the first response is to medicate. We have become a nation that has normalized anti-depressants – medications which are sometimes very helpful and necessary – but which have become a social norm reaction to our human response to stress. In 2008 Medicaid spent $3.6 billion for antipsychotic medications. Low income children, who are more likely to have experienced toxic stress from poverty, were 4 times more likely to be prescribed antipsychotic medications as other children (van der Kolk, 2014). However, when people begin to realize the enormous intrinsic power we have to heal, and begin to model those behavioral changes, social norms shift. When the respected leaders of any group – a parent, faith leader, executive director, an elder or teacher – begin to shift the narrative and model different behaviors, true change begins. Influential community voices help create these unspoken rules or guidelines, and have the power to reshape them. In 2014, the Catalyst Initiative of the George Family Foundation began exploring how relatively modest, strategic investments could shift social norms in communities where health disparities are high. Catalyst invested in grassroots community leaders who have the potential to shift social norms toward more acceptance of self-care and healing practices as normal activities. Three years later, evidence of progress is emerging. Native elders are galvanizing how American Indian people begin to heal from historic trauma by using culturally grounded mind body medicine. 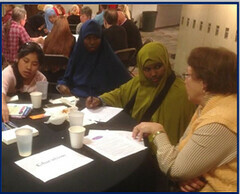 Somali community and faith leaders are creating and sharing healing toolkits grounded in Islamic teachings . 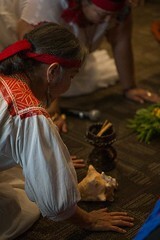 Traditional Latina healers called curanderas are embedding ancient healing practices into homes and clinics in South Minneapolis. Women veterans are claiming their own power to build resilience by training other women vets to be a core resource in their community. Rural Minnesotans are enhancing capacity to manage chronic disease though community circles. 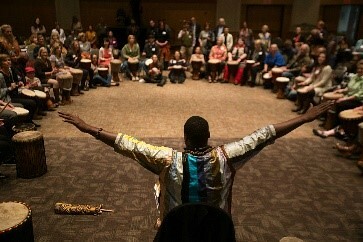 The Bantu healing drum is beginning to shift African Diaspora norms toward using cultural healing as a component of highly positive shared behaviors. There are complex and simple medical reasons why these practices are effective in helping reduce incidences of chronic disease and manage stress. The vagus nerve is part of the autonomic nervous system in the body, and it transmits messages between our gut, heart and brain. You may notice when you become agitated or nervous that respiration, heartrate, digestion and vocal quality are all impacted. By simply becoming still, taking notice and intentionally breathing into the moment, you activate the vagus nerve and send calming messages to gut, heart and brain. Heartrate slows, respiration becomes steadier. Our ability to notice our reaction to a stressful incident, become still, and slowly breath into the moment is completely within our reach at any time, we simply need to practice it. The more we practice, the more our muscle memory stores this practice. Catalyst is working to normalize these practices in ways that have meaning within cultural contexts – whether that is prayer, ceremony, movement or meditative breathing. Community based leadership is creating new network hubs of integrative practices. When these hubs connect though intentional engagement strategies, more energy is unleashed within this system of practitioners. As our networks grow, more people are normalizing self-care practices within their own lives, within their organizations and their communities.It is now time to ask how we amplify these new social norms to reach others, and begin transform our health care system from a reactive, disease care model to one that is truly normalizing self-care practices as primary care. What opportunities exist for us to model healing to external stakeholders and shape the social norms of a wider audience? How can this preventive approach build the capacity of every person to better manage stress and lead healthier lives through changing social norms? It starts with just becoming still and breathing into the moment.